LA Bike Trains was a massive 5 year project to explore the possibilities and realities of running a social transportation network of bike rides. Currently the full program has been retired for lack of fiscal sponsorship, but many lessons, spin-off rides, relationships and logistical learning continue. We’ve developed a community of bicycle commuters in Los Angeles that continue to help other people learn to get around by bike. 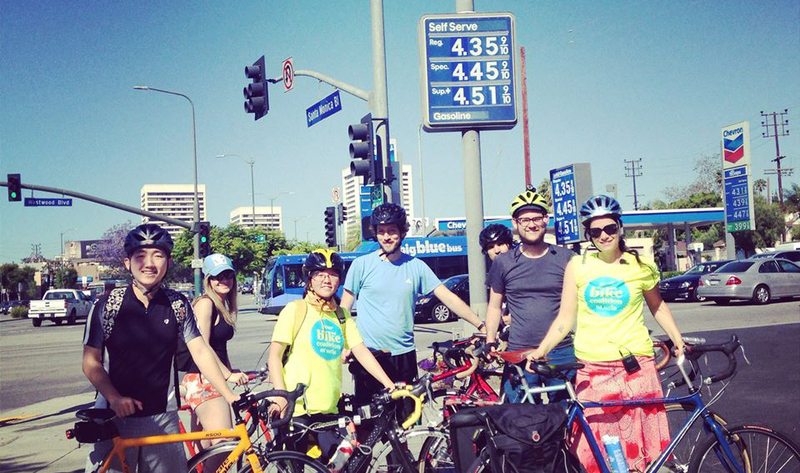 Join the Highland Park to DTLA bike train Wednesday mornings with Dale. Do you work with a large company? Bike Trains can be a healthy and rewarding way to reduce congestion, parking space and fulfill city transportation requirements. From workshops to get the idea started to a full data-driven program, bike trains are an ideal way to get people to a single location on a regular schedule. + BCI can help make that happen. Need to get to work in Los Angeles? Wish your commute was super fun instead of a drag? We provide a rolling party along select routes run by Conductors  experienced urban cyclists  to harness the safety of riding in a group while kicking it up a notch by making the ride a fun social experience. And its totally free! With 4 Routes throughout Los Angeles from Pasadena to DTLA and Culver City to UCLA; we’re represent a powerful network of bicycle routes, community engagement, education and good times. L.A. Bike Trains has quickly become a national leader in developing social biking solutions for some of the most pressing issues in transportation, sustainability and health. We partner with companies, cities and community groups to help people discover the practical joys of riding for transportation.